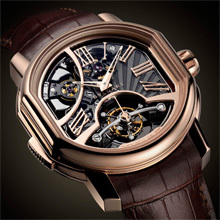 Daniel Roth Carillon Tourbillon, an original three-hammer Minute Repeater with a pure, contemporary face. 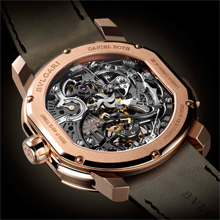 Its new calibre, entirely made in-house by Bulgari, features excellent acoustics and an original design. Within the field of complicated horology, striking watches are still the most difficult of all to make and consequently the most exclusive. Bulgari belongs to the select circle of brands capable of handling from A to Z the production of these distinctive and complex watches. The new Daniel Roth Carillon Tourbillon provides a brilliant demonstration of this accomplished expertise. This creation is the result of  several years of meticulous development. Its distinctive nature stems from a three-hammer striking mechanism, which is a fairly unusual configuration in this type of model. Striking watches generally comprise two hammers for Minute Repeaters, or four in the far rarer case of Grande Sonnerie or “grand strike” models. The hand-wound DR3300 calibre is deliberately generously proportioned (34.60 mm x 31.60 mm) and entirely crafted in-house. It comprises a total of 327 parts and beats to the rhythm of a Tourbillon-type regulating organ housed within a large-sized carriage. The construction of Calibre DR330 was governed by a number of precise and specific parameters, first and foremost dedicated to achieving ideal tone. The force and clarity of the tone are sensitive issues on all striking watches. Given the degree of miniaturisation required for this type of watch, a good-size calibre together with three hammers gives them higher torque and thereby enhances acoustic resonance. The set of three gongs fixed to the mainplate is coupled with an inertia governor that keeps friction to a minimum when the striking mechanism is in action, thus avoiding any audio interference. In the case of the Carillon Tourbillon, the gongs are meticulously and individually crafted in multiple stages. These entirely hand-made special-form gongs ensure perfect and absolutely identical sound quality. They are bent and shaped by hand, annealed (or hardened) at a temperature of 900°C, and then cleaned before being fired again at 500°C – an operation that gives the metal its crystal-clear resonance. After the various cleaning and polishing operations, they are fitted onto the movement, before final adjustments are made. They are placed lengthwise and their thickness may be corrected with a file, along with toothing on the driving levers – all of which is designed to perfect the resulting musical tone. The melodic sequence of this 3-hammer Minute Repeater striking three different pitches  plays a C note for the hours, an E-D-C sequence for the quarter-hours, and a single E note for the minutes. The movement is of course equipped with two barrels: one ensures the smooth running of the striking mechanism and is automatically wound when the latter is activated; while the other, when fully wound, guarantees the movement at least 75 hours of power reserve. Its state-of-wind is signalled by a corresponding indicator on the dial. The architecture of Calibre 3300, the delicately cut-out shape of the bridges and the positioning of the various components were designed to be original, contemporary and to strike a fine contrast in order to highlight the slender beauty of the mechanism. The meticulous finishes alternate between polished steel for the hammers, gongs, and tourbillon carriage, and open-worked surfaces; while the finely decorated mainplate and bridges are coated with an elegant NAC surface treatment, an alloy exclusively composed of noble metals belonging to the platinum family (platinoids): platinum, rhodium, ruthenium and indium. This high-tech coating which is hard to achieve through associating these four metals, gives the metal an elegant black colour. This construction is revealed through the sapphire crystal dial that is structured and cut-out to reveal the striking mechanism and the Tourbillon. It is protected by a pink gold case with a Minute Repeater slidepiece on its left-hand side and which slides along an unusual zone between 7 and 11 o’clock. The winding crown is individually engraved with numbers from 1 to 30, matching the fact that each of the 30 watches in this limited edition fitted with a transparent sapphire-crystal back and water-resistant to 30 metres. This elegant model is teamed with a brown alligator leather strap secured by a triple-blade folding clasp in 18-carat pink gold. 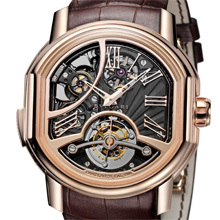 Calibre DR3300, hand-wound 327 parts, three-hammer Minute Repeater & Tourbillon with large 13 mm carriage; silent inertia governor; NAC surface treatment on the bridges and mainplate, bridges adorned with sunburst engraving, polished and chamfered steel parts, polished screw heads, gold-plated gear wheels.